There’s feeding them offstage, as in cookies or brownies, in which case they’re generally very easy to please. Onstage is a different matter. Often a script will call for actors eating (what we call practical food), and in my work as a prop master, it’s my job to procure it. Sometimes I buy it; other times that’s impossible or just plain inconvenient, and I have to make it for each performance. Below I offer a menu of my most unforgettable experiences in working with actor palates. Calls for a tea service with strawberry tarts; I also added shortbread—a proper British cookie—and iced tea stood in for hot tea. The character Pickering is supposed to eat unabashedly throughout the scene, every night, and the actor who played him quite enjoyed himself. Pickering also consumes a great deal of port in every show. Since alcohol is not something that benefits actors performing just above an orchestra pit, I provided a decanter of cranberry juice instead. And I told the actor that if he happened to have a urinary tract infection, we were about to clear it right up. Calls for impractical ice cream and pastries, which I made of homemade play-dough, and practical popovers, which I baked fresh every night. The character Amy loves them, but not so much the young actress who played her. She’d leave the popover in the same place on the prop table every night with one bite missing, and I’d finish it. Forgive me; this was college, in 1989. There is a party scene in one of these shows for which I set a few practical pastries on a little dish, and dozens more on a platter the size of a manhole cover. Then I told the actors that the ones on the giant platter were for the show and warned them not to eat them. They ignored me and tucked in every single day. I didn’t yell. I just got there earlier one day, hit the whole platter with spray polyurethane, and didn’t tell them. Does this mean I’m not a romantic? The script doesn’t actually call for practical food, but one director thought it would be fun to have the character Jacob munching on something during one scene. She settled on pasta. It got a laugh, and the Italian actor who played him was all in. Every night I brought him linguine tossed in olive oil, cracked black pepper, and Parmesan. He loved it. Shrek offers his crush, Fiona, a traditional ogre treat: a freshly killed beastie of some sort, plus odds and ends from the forest, in a sandwich. I used raffia, moss, bark, silk leaves, and my squirrel puppet. The script calls it a s’nother; personally, I called it an RLT (roadkill, lettuce, and tomato). Shrek and Fiona had to be able to munch on something from the sandwich, so I bought them gummy worms and tucked them into the edges. Fiona was impressed. Because anyone can send flowers. Top of Act 2, Jesus and the apostles are gathered for the Last Supper and are supposed to share and eat bread. I feel badly for the person who actually served the original 13 (whom I will forever picture as Mel Brooks), because it was a bear trying to get all of these guys to agree on what kind of bread they’d eat without complaint. I tried everything—matzoh, of course; Wonder bread; croissants (Mon Dieu! En Israel? ); rolls. The actors all gave maudlin little coughs and said, ‘I can’t eat this; I can’t sing.’ Finally I got them all to agree on something. But I’m sure I’ve relinquished my place in heaven for serving Jesus and the disciples KFC biscuits. 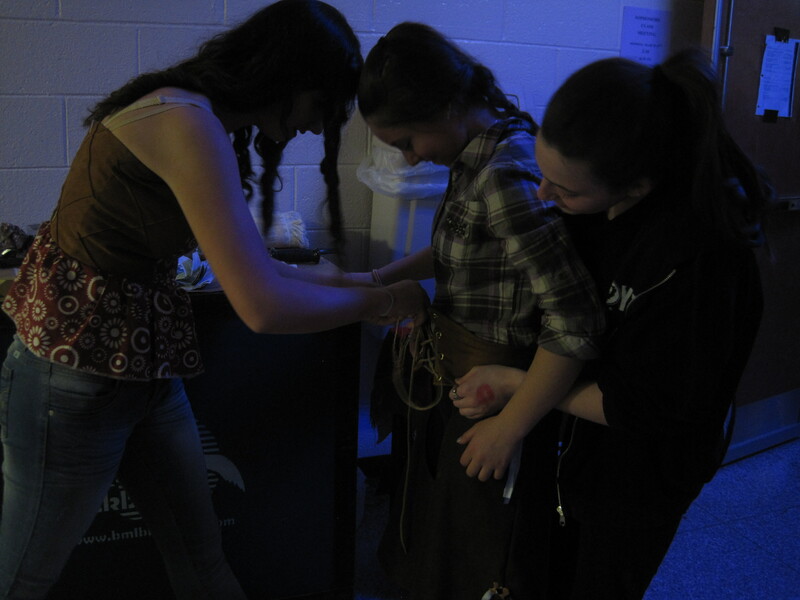 Two upper-classman girls helping a freshman into her costume belt. I’ve worked with kids for half my life, usually nursery school kids, and usually in the classroom. About 10 years ago I started working with teenagers in theatre. Then things got a little nutty. I mean, I stopped getting barfed on*, but I inadvertently added in drama onstage, drama backstage (if you want real drama), and much illumination. Adults like to moan about the shortcomings of kids, and teens in particular. This is nothing new. Back in 20 BC Horace was kvetching to the same tune, and it hasn’t stopped yet. Yeah, there’s vanity and techno obsession and laziness among teens. But so is there among adults. I’ve worked with both backstage, and quite honestly? If I were to assemble a dream team of ideal colleagues**, the scale would tip heavily in favor of the teens. In my experience crewing roughly four shows a year, they’re the reliable, enthusiastic, and hardworking ones. Most consistently. They’re also fascinating—wonderfully, sometimes heartbreakingly, candid. I like to engage them, and am humbled to be rewarded with a lot of trust. Everyone wants to feel seen. 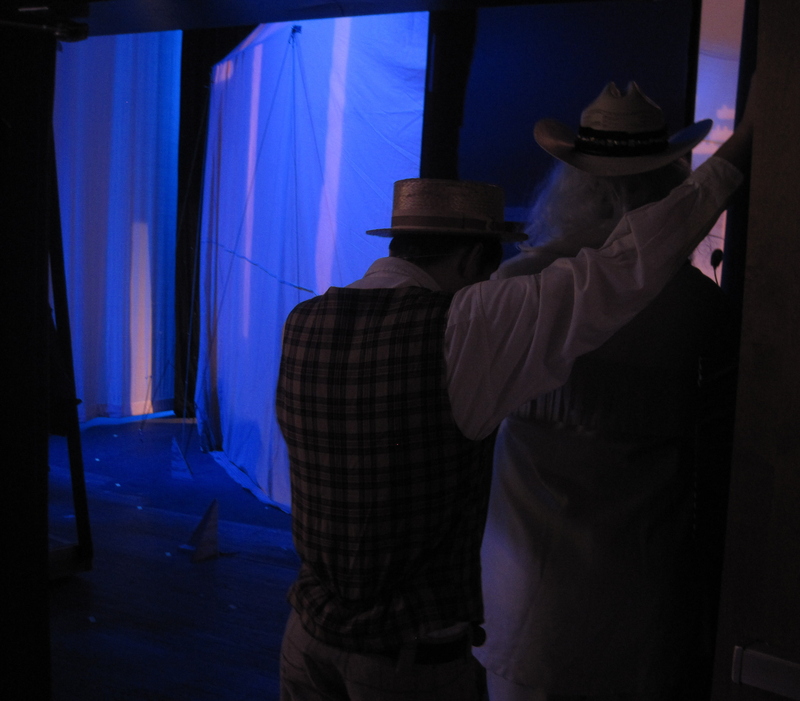 Actors waiting on stage right for their entrance cue. Story time. Seriously, I have tons. And I haven’t forgotten this is primarily a food blog. Don’t worry; food and teenagers are inextricably linked. …There was the boy who spent most of his time grinning and jumping off things—easily the most high-octane kid I have ever worked with. Once, after he told me about a beef stir-fry he’d made and was very proud of, he revealed to me—still grinning—that he was a hemophiliac. He hated feeling captive by it and knew risking injury was stupid, but said it kept him sane—like giving the disease the middle finger from time to time. …Seeing two freshman girls reassure, and embolden, and wipe the tears from an eighth-grade girl’s cheeks when a classmate had said something mean to her. …The girl who loved acting but became almost paralyzed with stage fright. She said once she got out there, she would forget her nervousness and enjoy herself. So every night at places, she would come to me and I would say, ‘You just have to make it for 10 more minutes. In 10 minutes you’ll be fine.’ A year later I bought a ticket for the winter show, which she was stage managing for the first time. I went backstage to see her because I knew she was nervous. When she spotted me she squealed, ‘OH IT’S MARISA OH I’M SO GLAD YOU’RE HERE!’ And I reminded her that she’d be golden in 10 minutes. …The boy who raced down the hallway with a pan of brownies, stopped in his tracks, held the pan out to me so I could pull off a piece, then kept going. He didn’t speak because his mouth was stuffed. 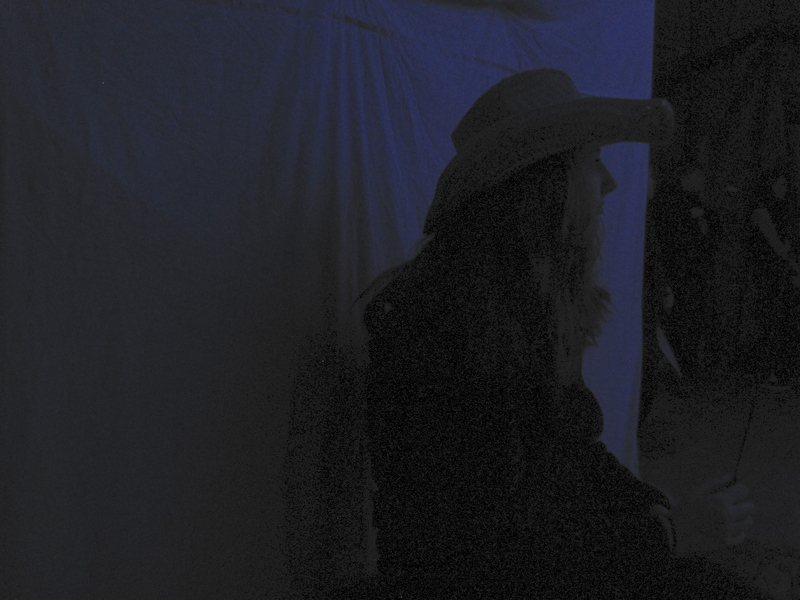 …The girl whose mother died just a few days before the run of the show. I was stunned when she arrived to rehearse. The staff said she did not want to talk about her mom yet, but just wanted business as usual. And every single kid in the show respected it. Every now and again I’d see one of them walk past and squeeze her shoulder, but not say a word. …Once I brought in a big box of homemade cookies, and another day a bigger box of chocolate truffles. I have no pictures because crumbs and empty candy cups dusted with cocoa powder don’t make stellar shots. …I asked two students what topics they chose for their senior theses: (1) the history of the transgender movement; 2) the wisdom—or folly—of knowing the future, with citations from the movie Dune and Vonnegut’s Slaughterhouse-Five). How cool is that, really? …One actor confided he wasn’t sure he wanted to go to college, and was on the outs with his family about it. He also confided an injury, and when he came up with a new way to dance that kept him from pain he was so excited to share it. …I learned that the kids who are the shining stars, the most charismatic, the most beautiful, need more TLC and a shoulder to lean on more often than the average kids. My most recent crew kids liked to mark the number that was next up so they could look ahead to their cues. They were new to crewing, and I’ve never seen this idea in action before. It’s a good one. …High-fiving an actor every night when he came off stage for not incinerating the building in a scene in which he held a Zippo up to a travel-sized can of hairspray. An admirable accomplishment. Actors will be actors. 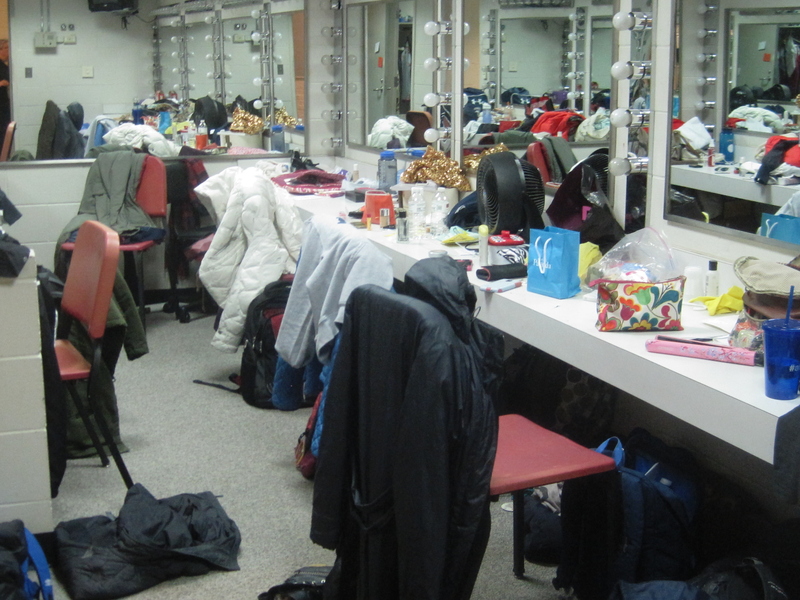 Dressing room tidiness. …When I complimented another kid, from Korea, on the stones it takes to go to school halfway across the world when you’re only 14, and asked why he did it, he said, ‘Do you want the brutal truth?’ I said yeah. And he replied that kids in his home country were expected to study 8-12 hours a day, and by going to school in the U.S. he could do ‘all this,’ and waved his arms across the stage. ‘It’s much better,’ he said. A little later he went to the concession table, bought two Sprites, and gave me one. …The crew girl who hurdled actors and set pieces to make her cue on time. She lost her house in Hurricane Sandy and was displaced for a year while her family built a new house, but was unfailingly upbeat and worked just as hard as she ever had. She would be on my dream crew. A crew girl waiting, tie line in hand, to pull at her cue. *To be fair, that only happened to me once. Poor kid. **Because regardless of age, that’s what they are, since we’re all working toward the same goal: a good production. 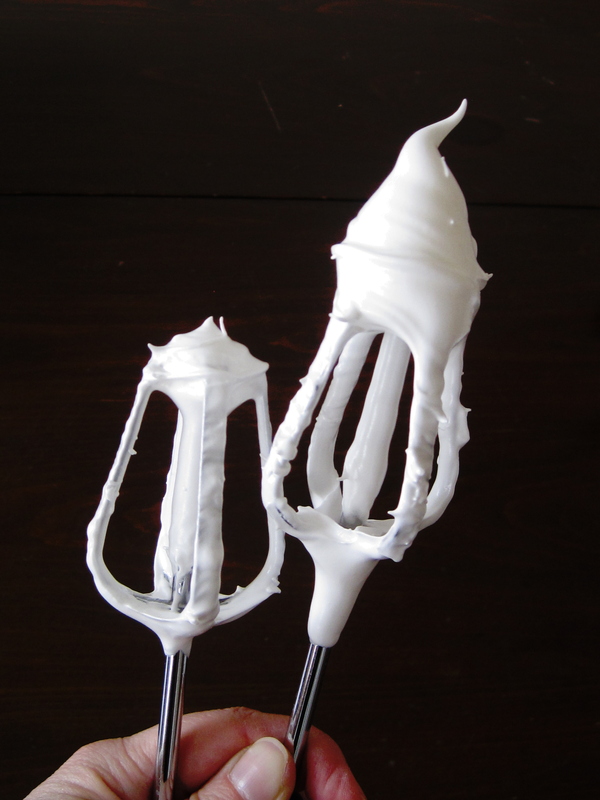 Warm marshmallow frosting for Devil Dog cupcakes. Random. Not in the post. Whatever. I’ve gotten the impression, after talking to people about food and and reading a lot about food (which is what I do in my spare time when I’m not eating), that many people avoid cooking for two reasons. It’s because they’re either lacking proper information, proper equipment, or both. Here, then, a list. Above all, please keep in mind the helpful words of the late and much-lamented Douglas Adams: Don’t Panic. You’re not supposed to loathe cooking. My goal here is to make the kitchen more approachable. This stuff you can do. 1. Get over your fear of freezing. I was taught that freezing any food besides uncooked meat ruins it. Freezer burn was a yucky reality in days of yore, and everything else from the freezer had a weird taste. Pretty sure most of this was due to poor-quality storage containers. But today you can safely freeze almost anything as long as you make sure it’s a) completely cooled and b) use plastic freezer zip-close bags. Make sure the box says ‘freezer’ on it. Slice up your fresh babka or bagels, squeeze the air out of the bag, close it and chuck it in the freezer. In the morning, take a slice out of the bag and set it on a plate. * Then go blow-dry your hair and find your shoes. By the time you’ve done that, your breakfast will be ready to eat. It will taste the same as the day you baked or bought it. 2) Repurpose utensils. I use my kitchen scissors to snip scallions and pieces of bell pepper; I smush up apples into applesauce with a potato masher; I whisk with a fork. Don’t buy any utensil that has just one purpose (garlic press, ice cream cookie sandwich mold). You’ll use it once, then it will clog up your drawers. Go low tech and open up the format with how you use your utensils. 3) Buy three good-quality knives and give away the rest. This is huge. I’m convinced that a lot of people who think they’re no good at cooking or get frustrated just at the thought of it aren’t using decent equipment. Knives are first on that list. You need a paring knife (to cut small stuff that you can’t snip with your scissors), a chef’s knife (to chop big stuff, herbs, or chicken) and a serrated knife (for slicing bread, tomatoes, and chopping chocolate or nuts). Knives should be somewhat heavy and the handle should not be made out of crap plastic. Be sure that the metal of the knife extends right down through the handle for good balance. If your knife is flimsy, you’ll be fighting with it to chop, it’s going to break by Thursday, and what’s more, it’s dangerous. 4) Unless you’re serving a cake to company and are excessively precise, ignore recipes that tell you to both butter and flour the pan. Wow. Okay, that one’s done. 5) If you’re a novice cook and want to have people over, go with simple, straightforward recipes. Novices tend to make pheasant under glass and petit fours with spun sugar, usually with nose-dive results. They want to impress their friends. Their friends, on the other hand, want to eat. Ask around for recipes that are tried and true, pace yourself, and read the recipe all the way through before starting so you know what ingredients and utensils you need. Make brownies for dessert. *If you’re lucky enough to have a radiator, put the plate on it. I have a cookie sheet on top of my kitchen radiator for just this purpose. Me efficient. I love to make treats for the casts and crews of my shows, and to give as holiday gifts and thank-yous. 99.44%* of the time people love it. But that itty bitty percentage** left over gets all judgmental on me. ‘How can you make these things knowing there’s such an obesity problem in this country?’ they ask. I’ve even had people ask how I can live with myself, as if baking with butter and sugar is akin to mooning a Gymboree. Here’s my thinking. Yes, a massive pile of Americans are obese. But they didn’t get that way from having a brownie at a Saturday night barbecue, or a couple of Bubbe’s latkes at Chanukah, or Cadbury eggs on Easter. And goodness knows I am not a doctor or a nutritionist. But I have mambo’ed with weight gain and loss my whole life. As my ninth grade biology teacher said, if you consistently eat more than you burn off, you gain weight. That’s how it works. So with a few exceptions, I’m pretty sure those suffering with serious weight issues got that way from consuming too much, or consuming rich foods too often—foods that are meant to be once-in-a-while treats. Your Great Anye’s German stollen, that wonderful buttery dried-fruity holiday bread—that’s a treat. You’re not supposed to live on it. It’s a Christmastime joy, along with goodwill and empty parking places. The problem comes when the line between treats and everyday healthy foods becomes so blurred that for breakfast we grab a doughnut made with shortening and fake colored sprinkles instead of scrambled egg whites and whole wheat toast, or for lunch we choose Cool Ranch Doritos instead of a turkey sandwich. Many of us have forgotten the difference, forgotten to be discerning. And so we get fat, and we judge ourselves and others for it. We forget that eating, like most things in life, is about balance. We’re supposed to make healthy food choices most of the time. And we’re supposed to celebrate with indulgent foods at special times. Yes, supposed to. If we can decide to live by that tenet, maybe we’ll work out this obesity epidemic (or at least come closer to doing so). And I can’t think of a better time than now, holiday time, to emphasize balance in eating. Please, have some of your mom’s killer lasagna bolognese and your best friend’s oatmeal cookies this holiday season. Just go easy the rest of the time. Get your veggies in there. Drink lots of water. Take care of yourself. The really good news is when we choose to live this way, choose to eat healthy foods*** most of the time and blow it out a little on the weekends and on holidays, we’ll look forward to those special treats that much more. Remember anticipation? We’ll feel like kids again. 1) Last week I overdid it: I drank hot chocolate every single day without fail. Even with 1% milk, that’s a lot. This week I have to do better with balance. 2) I’m totally in the mood to make my mom’s sour cream coffee cake, but it’s something that we kids grew up eating on Christmas morning. I am making myself wait, just like I did last year, and I know I’ll be glad I did. I’m so excited for that cake. It’s something, like the stollen, that says yesterday is gone, tomorrow is later, and I am living for this flavor, this texture—this luxury—right now. And there’s no crime in that. *With apologies to Ivory soap. You’re doing a fine job. **Don’t make me do the math. ***Which doesn’t mean it should taste like a loofah sponge, by the way. Find recipes that use spices, herbs, garlic, the good stuff, and you will not deprive yourself.